This time the decision is final – or so says Etiwanda safety Kamari Pleasant. The 6-foot, 180-pounder has made a verbal commitment to the University of Washington, just a few days after decommitting from Arizona State. Pleasant had eight offers from which to choose when he made his decision the first time, only to get the feeling later on that he wasn’t as high on Arizona State’s radar as he was on them. His final decision came down to Washington, USC and Oregon. Ironically his earliest memories were of the other schools. He grew up liking Oregon but always liked Reggie Bush and his father was a big USC and Reggie Bush fan. “It will be fun playing against them,” he said. Pleasant was one of the more versatile players in the area. He got drew most of the interest from major colleges on the defensive side of the ball but also saw time at running back and wide receiver. 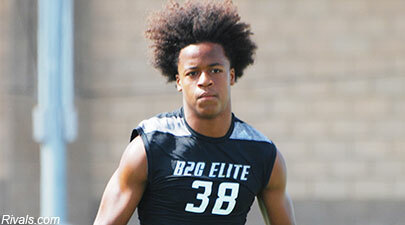 Etiwanda defensive back Kamari Pleasant has de-commited from Arizona State and is now looking at other options. Pleasant won’t be wasting any time making up his mind though. He said he plans to announce his decision on Thursday and it will be between USC, Oregon and Washington, all of which he has already visited. It all came down to a numbers game. The Sun Devils got commitments from some other safeties, pushing Pleasant down on their list – or so he thinks. Pleasant made that decision today. He contacted Arizona State to let them know of his decision, then contacted other schools to let them know he was still available. Pleasant, a first-team All-Baseline League selection had eight offers from which to choose when he made the decision for the first time. Safety Kamari Pleasant of Etiwanda High made it a Christmas Day to remember after he announced on Twitter that he verbally committed to play football for the Arizona State Sun Devils. While many recruits across the country simply announce their commitment with a simple tweet, Pleasant added some flare to his announcement by tweeting out a video with his decision. “I have a lot of choices on my plate and not many choose this route to take but I want to be great,” Pleasant said in his video before the Arizona State logo flashed across the screen. The decision to announce his commitment was rather easy to make on the holiday. With offers on the table from programs such as Oregon, UNLV and UTEP, it was ASU that had become involved in Pleasant’s process early on. Etiwanda High School senior Kamari Pleasant has excelled on both sides of the ball. But heading into this season he looked to destined to play safety in college. Well, not so fast. That will should give him more options moving forward. He has three offers – UTEP, Montana State and Oregon, with the latter coming as recently as Sunday. Pleasant says he doesn’t prefer one over the other. He’ll do what ever gets him on the field faster. He is actually the team’s leading rusher with 42 carries for 301 yards and two touchdowns. He has five receptions with one touchdown and has an interception on defense. He is keeping his options open for now. He will take a visit to UCLA this weekend and one to USC the following week but those will both be unofficial. He hasn’t settled on any official trips. The Eagles (2-3) are off the week and will start Baseline League play the following week against Upland.